Do you think you’d be much happier if you won the lottery? Do you think you would be much less happy if you were paralyzed in a car accident? If you answered ‘yes’, science is against you. In 1978, Brickman, Coates, and Janoff-Bulman published an article in the Journal of Personality and Social Psychology. They’d looked at 22 people who had won the lottery and 29 people paralyzed in accidents and found that, some time after these major, supposedly life-changing events, their levels of happiness went back to being similar to a control group who had had neither major good things nor major bad things happen to them. In other words, they were living in the snow globe. 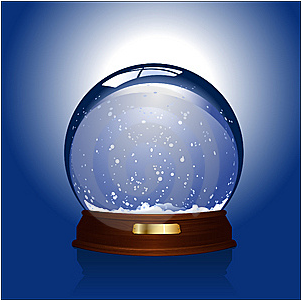 If you’ve ever played with a snow globe, you know how, when you shake it up, the snow flies everywhere and it’s all very dramatic. But after a while, it all settles down again and it’s just the way it was before. Nothing has changed except the exact distribution of the individual flakes of snow. Overall, it’s the same as before you shook it up. So, can we ever leave the snow globe? Or are we stuck with about the amount of happiness we have always had? Well, according to studies of twins, between 22 and about 55% of our individual difference in happiness is genetic. So there is a limit to how much we can affect – but it’s a generous limit. And recent research into “sustainable happiness theory” suggests that, while the study of the lottery winners and the accident survivors was probably right in what it found, there was also some important stuff it missed. What does improve your happiness is not changing your circumstances, but changing your patterns of activity to give yourself a continual series of “fresh positive experiences”. Autonomy. Increasing your perception that you “own and agree with your own behavior” also increases your happiness. Competence. Feeling that you do things well or are improving in ability increases happiness. Relatedness. Feeling connected with at least some other people increases happiness. You also need a “will” (to want to increase your happiness) for the process to work, and you need a “way” (concrete means of increasing happiness) for the effects to be strong. This study had three other important findings about the pursuit of happiness. Firstly, if you pursue a life goal to do with autonomy, competence or relatedness and fail, it’s likely to bring you down more than failing at a life-circumstances goal. Presumably this is because it means more. You’ve got more to gain, but you also have more to lose. So make sure you pick a realistic goal. Secondly, to continue at a higher level of happiness, you need to continue to work at success in those life-need-related goals. It’s the flow of new challenges, successfully met, that seems to be producing the happiness. So pick a goal that allows you to continue to challenge yourself. Finally, people who went in believing more strongly that they could increase their happiness (and that this would be a good and appropriate thing to do) gained more happiness. Which sounds at first like another way of saying that a positive mental attitude helps you have a positive mental attitude. Who would have thought? What it means, though, is that being open to the benefits of new experiences is part of increasing your happiness. So, what goal will you choose to pursue to meet your needs for autonomy, competence and connectedness? It’s likely to make you happier, and bust you out of that snow globe you’ve been living in. Mike Reeves-McMillan has much more to say about how to be happy at his blog, How to Be Amazing.